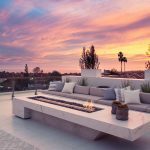 We’ve talked about ways to improve your exterior and backyard with amazing design ideas, sizzling outdoor kitchens, gorgeous pools, and lush gardens, so we thought it would be fun to show you a few awe-inspiring designs that surely turned a few heads! 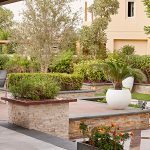 There are thousands of impressive and unique designs and styles to add to your collection of garden landscaping ideas, but we’ve listed ten here. Have a look! A beautiful garden design will transform your backyard into a little heaven. Designing a space where you can relax, surrounded by the peace and tranquility of nature will do wonders for your mind, body, and soul. This garden studio is mesmerizing and offers a beautiful place to unwind and relax. What we love: The pergola inspired shed creates a space to sit and dine and the lush green Murraya Jasmine spreads a lovely fragrance. Who wouldn’t want to sit back and unwind here? 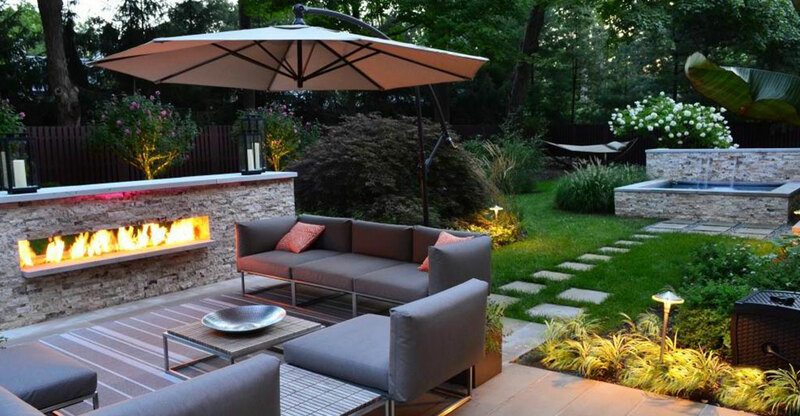 Your backyard doesn’t have to be huge to turn it into a space that you will absolutely love. This backyard is short on space, but the designer maximized every square foot by incorporating Stone clad retaining walls, patio furniture for outdoor eating, and cantilevered pergola to cover the outdoor kitchen area. 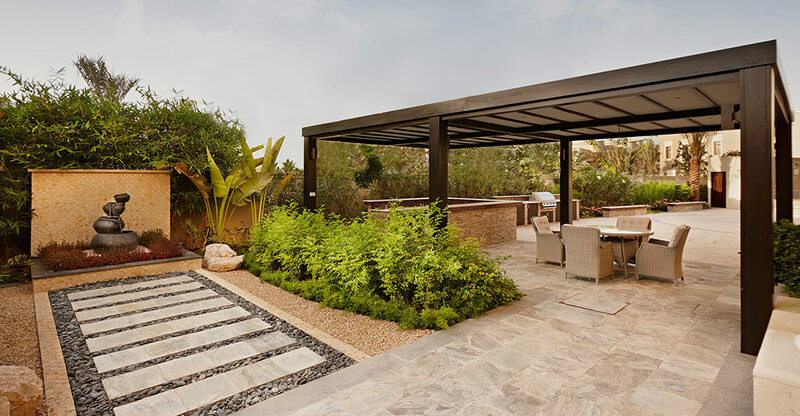 What we love: this sleek pergola not only creates a separate space but also offers relief from the sun and heat during those warm summer months whilst you cook. What’s not to love about an Asian-inspired backyard? From the tiered roof to the Zen inspired greenery, every detail of this stunning design is a sum of the larger design scheme. 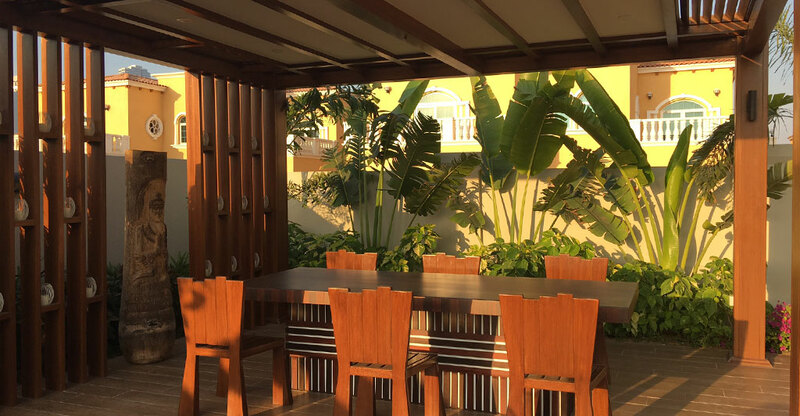 What we love: the outdoor seating, sun loungers are embedded within beautiful greenery and carefully collected outdoor sculptures and a pool set within spacious, clutter free garden gives the area a vibrant feel. 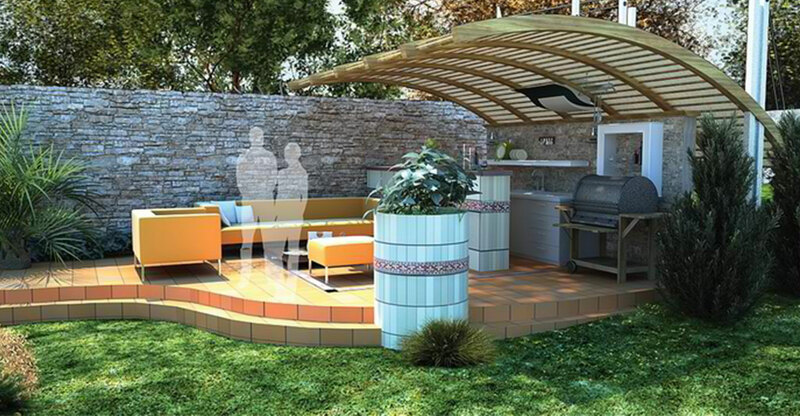 This backyard design has a lot to love! 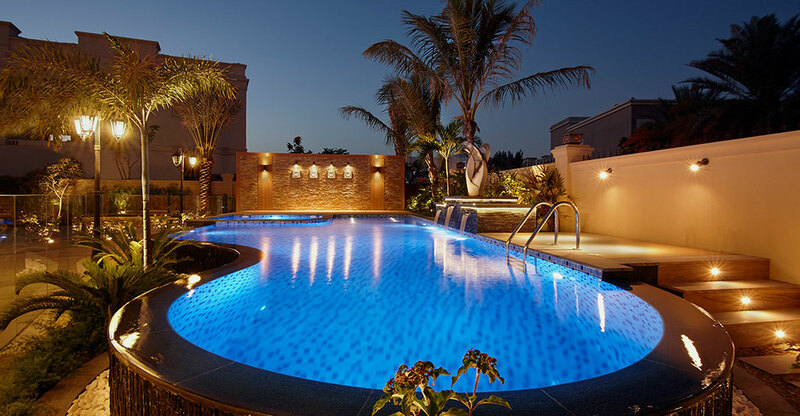 The massive pool resembles a sparkling lagoon, with a jacuzzi and water feature. Not only is this area peaceful and relaxing but it also adds value to the home. What we love: the decorative stone wall stretches past the stone pool deck to hide the pool pump room and shower and tropical Balinese feel brought by the Palm trees. This stunning home full of windows offers a beautiful view of the garden and pool, while the raised steps adds the culminating touch through the lighting. This thought-provoking design once again proves that you can do a lot with a space with careful choice of levels. What we love: the steps and pool deck, flanked by the outdoor bar and Barbeque area, giving it a simple open modern feel. If you’re looking for seclusion, off the beaten path, this is the yard for you. The resort like feel, meandering grass, different levels, multiple seating spaces create a feeling of being far away from the busy world. What we love: as the sun sets, curl up on the gazebo cushions and sip a drink, chat with friends and enjoy the serenity of the calming space around you. From what we’ve seen so far, the most impressive backyards have dedicated spaces for each area. The yard below has a fire line incorporated within the bar counter encircled by chairs to entertain and relax with family and friends. Further, back is the outdoor dining area and water feature. What we love: the unique foliage and architectural designs add just the right amount of character to this amazing back yard! I would love to have a corner like this! Everyone needs is a cave retreat when you want quiet time outside to write your vision, dreams or simply to think. What we love: the beautiful wall tiling pattern, neutral colors beautifully combined, natural bamboo surrounding the little area. This cool children play tent creates a cozy corner for them to relax and play. It’s a little tent, very cost effective and cute. 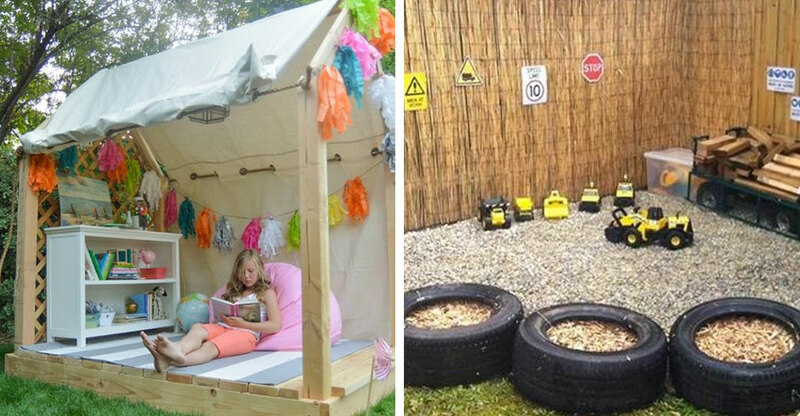 What we love: A special corner for children in any shaded area. Modern and spacious, a 3 m long table sits in the center of a waterproof pergola. What we love: Solid wood shade structures, bar and a warm feel to this garden. Totally clutter free! Stunning! 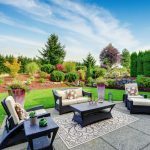 From lush gardens to manicured yards, there is inspiration to be discovered in a variety of backyards. If you’re looking for a little help to turn your backyard into a relaxing getaway, the designers at Milestone are always ready to help. Already have an amazing backyard? We’d love for you to share it!